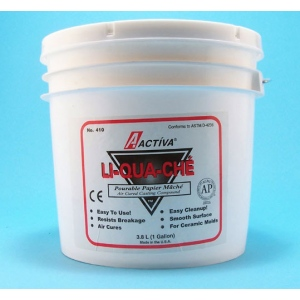 * Li-qua-che is a paper-fiber reinforced, polymer based compound that is air-cured, not fire hardened. * Designed to be used with plaster ceramic molds, it dries to a hard, durable, break resistant product. * Li-qua-che should be poured approximately at the consistency of cream. * Stir the mixture with a paint stir stick, making sure that any material which has settled on the bottom has been completely blended in. * Pour slowly to avoid air bubbles. * Once the mold is full you can set it aside for 15-30 minutes, depending upon the size of the casting. * Depending on the size of your mold, you can generally empty the mold after only 15-30 minutes. * Let the mold drain off for another 15 to 30 minutes and you're ready to remove your casting from the mold.